When David Ralston met Rosemary Brown a unique blend of talents came into being. Rosemary with her equine experience, both in the competition world and working at Glasgow Vet School, David from a background steeped in agricultural and farming traditions of the West of Scotland, including working with heavy horses. They quickly established a reputation for running riding schools and livery yards where the clients' experiences were not only informative but confidence giving and FUN! They established a solid client base of weekly riders of all ages. As time went by these clients became more proficient. They also became more ambitious and many of them aspired to own their own horses - livery was not a problem - David and Rosemary had excellent facilities at Easterton Stables near Milngavie. Sourcing suitable horses, however - capable of competing to a certain level, but also able to live out and above all, be safe to handle and ride - proved less easy. David and Rosemary decided that the best solution would be for them to breed their own. They brought together a group of brood mares of proven talent and temperament, then used their experience and contacts in the horse world to locate potential stallions - and so the DRB Stud was born. 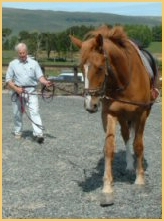 David later became involved with the Irish Draught Society - he and Rosemary came to realise that this breed was perfect for providing amateur horses, both as full and part bred. On this website you will see the quality of youngstock DRB is producing. You are welcome to come along and meet them. But don't wait too long...some are already off to new homes.